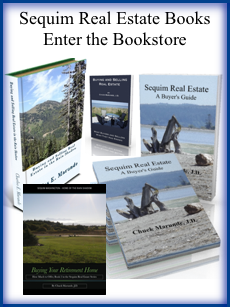 A couple put their home up for sale in Sequim on a private road, which serves six other homes. This private driveway easement is a legal easement on the plat that created this little subdivision. That means this is a legally enforceable easement, and it is forever an easement that “runs with the land.” The easement (or driveway) is gravel, well compacted, and has not needed maintenance for 40 years, apart from an occasional filling of a small pothole with a shovel by one of the homeowners. The homeowners, like tens of thousands of rural homeowners on the Olympic Peninsula (and across America), never formed a formal homeowners’ association, and they have no intention of doing so. The original developer never created a formal road maintenance agreement in writing, and the homeowners who bought the lots got loans to build their homes, and subsequent owners also got loans to finance the purchase of these same homes. No one ever saw the need, nor did they want a road maintenance agreement. Why would they? The road never needed maintenance of any significant measure, and a shovel and twenty minutes once or twice a year filled any potholes. Why create a bureaucracy when none is needed? The homeowners drove for four decades on this driveway, as they call it, without any need to discuss homeowners’ associations or road maintenance agreements. An elderly couple in this subdivision decided to sell their manufactured home on one acre. The buyers are in their 70’s, too, and apply for a loan. They qualify for the loan, but their lender tells them days before closing that someone in the bureaucracy, i.e. the FNMA regulators in the sky who rule the underwriters, are threatening not to make the loan unless all seven homeowners agree to a written private road maintenance agreement, have their signatures notarized, and record it. The agreement must state that all private road maintenance expenses will be shared equally among the seven homeowners, or words to that effect. 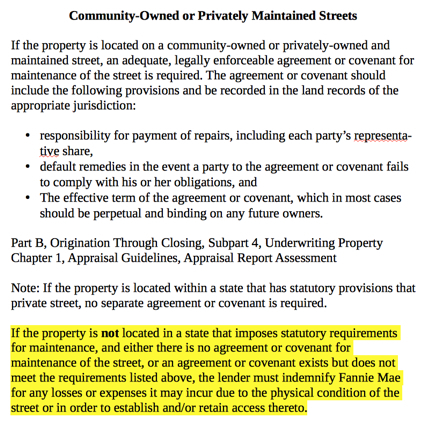 According to FNMA, if a written agreement cannot be obtained, “the lender must indemnify Fannie Mae for any losses or expenses it may incur due to the physical condition of the street or in order to establish and/or access thereto.” Since no lender on the face of the earth is going to agree to such an outlandish indemnification, one has to wonder if these bureaucrats ever had any real world experience in real estate. For those of us in the field with our boots firmly planted on terra firma, living and breathing real estate, and for Realtors like me who practiced real estate law for 20 years and drafted hundreds of real estate documents, including many private road maintenance agreements (and litigated the language in these agreements), the naivete of these underwriting and FNMA regulators is shocking. Why Require a Private Road Maintenance Agreement? I asked one lending bureaucrat what motivation would any of the homeowners on a private road have to sign an agreement that obligates them to do something they have never had to do before? He acted as though he did not understand the question. These regulators will kill a loan before they will answer critically important questions, such as these. Who will hire an attorney to draft a legally sufficient private road maintenance agreement? Not the buyer. Not the seller. Not the homeowners. Who will pay that attorney’s legal fees? Who will track down all the true owners of the properties on the street and schedule appointments to present the private road maintenance agreement? Who will calculate the amount each homeowner should theoretically be charged for road maintenance? (It is theoretical because on most of these private driveways, there have never been any expenses or maintenance costs whatsoever.) And the apportionment of road maintenance is not necessarily equal. The homeowners at the beginning of a long driveway will argue that they should not have to pay for the costs to maintain the road for a quarter mile when they only use one hundred feet. Who will meet with the homeowners and explain the purpose of the agreement, the interpretation of the language in every paragraph, and who will explain the legal significance of signing the agreement? The bottom line is that there is virtually no possibility 20 or 10 or even seven homeowners will all agree to sign a private road maintenance agreement simply because one homeowner wants to sell their home to a buyer whose lender is subject to Fannie Mae regulation FNMA: B4-1.4-08. The final result is that many homeowners will be unable to sell their homes, especially manufactured homes, subject to this profoundly unfair regulation. This regulation will hurt many elderly couples who must sell their manufactured homes on a private driveway due to health reasons or the death of a spouse. This regulation has never been enforced in the Sequim area, but now many elderly homeowners will find out that their homes are unsellable, since cash buyers are extremely rare for manufactured homes. The regulators don’t understand real estate, and they certainly do not understand the implications of requiring private road maintenance agreements, or they would never have written such a profoundly ridiculous rule. Since a recorded easement, like the one in this story, is legally part of the real estate, a recorded deed of trust secures the loan with or without a road maintenance agreement. The potential problems they imagine for lenders is roughly one million times less than the problem they have created for buyers and sellers. Of course, the regulators never consulted with me or other Realtors in the business in rural areas, but there would have been an easy answer if they really felt themselves compelled by an overpowering desire to create such a regulation. 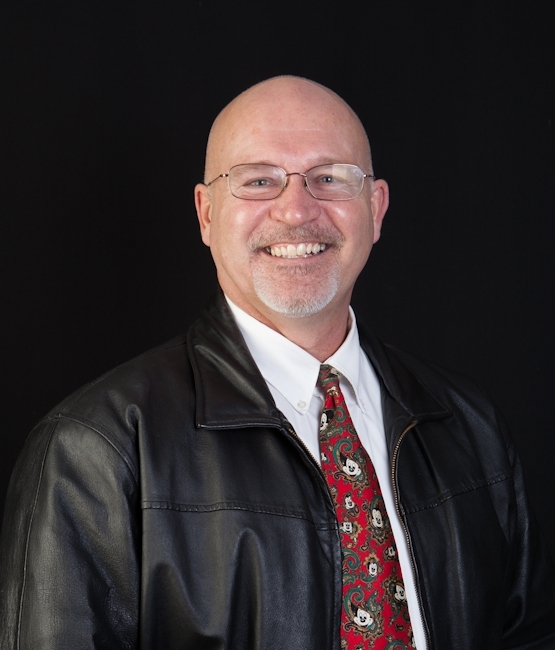 They could have added an exception that allowed a lender to include a statement explaining why such an agreement would be inappropriate for the local real estate market and why it would create an undue burden on all parties involved. But they did not. Private road maintenance agreements should never be forced on private property owners by regulatory fiat. An easement is a non-possessory interest in the land of another that entitles parties to a private right-of-way, embodying the right to pass across another’s land. The cost of maintaining an easement is shared by the land owner and the persons with the legal right to use the easement. The parties can determine the terms of the maintenance in an agreement recorded with the county auditor. In the alternative, if the parties do not have an agreement regarding maintenance, the cost of maintaining the easement must be shared by the parties in proportion to their use of the easement. Each party is required to repair any damage that they cause due to negligence or abnormal use. In resolving conflicts between the parties, the frequency of each party’s use of the easement and the size and weight of their vehicles should be considered unless the agreement determines otherwise. A civil cause of action for money damages, specific performance, or contribution may be brought if a party fails to maintain the easement according to an agreement or fails to pay their portion of the cost for maintenance in the absence of an agreement. The court may order the parties to submit to arbitration. The court (or arbitrator) may order any equitable relief that may be just under the circumstances, and must award the prevailing party all court costs, arbitration fees, and reasonable attorneys’ fees. The act applies to all easements existing on or created after January 1, 2012. The act does not apply to any easement held by any public entity, railroad company or affiliate, and entity regulated under the forest practices law. Update February 25, 2015: For reasons unknown, the above bill was passed in the house and the senate, but never passed in final form to become part of the RCW (Revised Code of Washington), and those bills languished since 2012 until now in 2015 when H-1237.1 has revived the old bills for creating a new law for private road maintenance. Finally, it appears that it will become law and save hundreds of thousands of homeowners from the dictates of FNMA that could kill the sale of their home (and the financing for the buyers). The final bill has not been passed as of today, but you should be able to track its progress and see the final bill as passed at this link: Washington Private Road Maintenance Agreements. The new law will be placed under Title 64 of the RCW, so that’s where you’ll be able to find it when it is finalized. Update March 23, 2015: Sad news folks. The above bill has died. The politicians in Olympia probably have no idea of the importance of it, and they didn’t take any time to vote on it. No one cares. Oh boy. Wait until you try to sell your home on a private road and your buyer cannot get the FHA loan. Hundreds of homeowners will be affected by this, and imagine the devastation if you simply cannot sell your home to anyone getting a loan that requires FNMA involvement. By not passing this simple bill, many will not be able to sell their homes, except to cash buyers or those getting a conventional loan. 25 Responses for "FNMA Killing Transactions by Requiring Private Road Maintenance Agreements"
This article was very helpful. I was searching nationwide for an answer to my question, and you are the only one who answered it. Thank you and God bless you. Thnx for your well written article. I think it is frustrating that politicians won’t make the simple fix on this huge problem for homeowners. We were thinking about buying a home on a private road, but then we decided not to because of what’s going on with FHA loans on this. I’m also dealing with this stupid mess. Dirt road. Maybe 130 ft by 12 ft in dimension. What a crazy and stupid situation. My neighbor has an easement on a shared driveway, but I’m looking to refinance a conventional loan into a lower interest rate VA loan. The bank won’t lend to me unless I can get my neighbor’s written maintenance agreement. This is why the framers of the Constitution devised the Constitutional Convention… to get rid of bad laws. If the 17th Amendment wouldn’t have been then state governments wouldn’t have ever allowed the FNMA in the first place. Write your legislators and hire a lawyer. There’s a lot of frustration and anger out there, all because the politicians in Olympia have not solved the entire dilemma with a very simple bill that was already drafted a couple of year back. All they have to to is approve the bill. Why haven’t they? They don’t know the importance of the bill and how this is killing sales by homeowners all over Washington. Unfortunately, it takes a lot of angry people uprising before our politicians get their act together. My wife and I became victims of the Fannie Mae PRMA requirements last year. It would be impossible to get a PRMA with our neighbors. We are lucky none have killed each other. Are you aware of another legislative effort this year? Where does the opposition come from if you are aware? I also got this call today, “I’m calling in regards to house bill 1841 that you got rolling down in olympia. We’re on a private road that involves the DNR, Warehouser, and an old railroad easement. There’s about 12 or 15 parties in here, and now they can’t sell their properties . . ” because everyone can’t agree to sign a private road maintenance agreement. Note by Chuck Marunde: You will never get 100% to sign. Not going to happen. This is a Federal mess created by idiots at the FNMA and HUD and VA. Our state politicians can resolve it by passing the bill that was drafted years ago. The House bill, now HB 1841, was reintroduced in Jan. 2016. I urge everyone with an interest, and your friends, to send a comment to your legislators at https://app.leg.wa.gov/pbc/bill/1841 . It’s as easy as a quick email. 19 of 24 parcel owners stepped up on a handshake when our bridge washed out over a year ago, and we got a culvert in. We stand a far better chance of collecting from the 5 holdouts, and revising our useless old covenants, with this bill in law. As this blog shows, these ugly little dramas are playing out badly all over our state, all the time. Let’s get this fixed. Just yesterday after receiving a copy of the appraisal we paid for to obtain a HELOC, we are informed by the lender, a credit union, that we must provide a PRMA prior to closing. Jesus. Fortunately for us we don’t actually need the money, but this could pose so many problems for everyone on our road in the future. I might have a good chance of getting the 3 other property owners to sign something but it will have to be well crafted. What a croc of crap. Just had a deal fall through in he DC Metro area for the same reason. Major banks are now defaulting to those standards on non fha and non fnma loans too. Fairbanks, Alaska – dealing falling through as I write this. I am in utter disbelief about this and angry beyond words. Michael, very sorry to hear that your deal is falling through because politicians cannot get their act together. Isn’t it amazing how far removed the lawmakers are from the rest of us ordinary folks. How many more people are going to lose their sales around the country because of this glitch in the federal regulations and state laws? Ditto! Same thing happening to us in getting a refi for a property we have owned for 2 1/2 years in Island Park, ID. Sellers, Buyers and refinancing homeowners beware! We are just sick to our stomach about this. You are an honest straight shooteer who goes the extra mile. Thank you from a disabled veteran. When the ‘coveryerass’ govmint gets involved you should expect nothing less. People, cooperate and make the beauracracy go away. 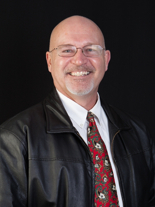 Im a realtor in the suburban Detroit area. And have a lender require it on a FHA deal. Private canal street. 11 homes. one owner will not sign. I did another deal fha 2 years ago and they did not require on a differant private road? My mother passed away last year and we sold her house. The closing date was April 1,2017. The VA turned the veteran down because the house is on a private road. So the lender Chase bank says. do a conventional loan. We extended the closing date until April 14. The banker said it would close. Guess what? Three days before closing, the banker said they couldn’t do the loan because of the road! Now the closing date is April 24 and there are 15 residential properties on the road. The road is in great shape because everyone takes care of their portion. Now I have to work on a road agreement. It’s been a nightmare! The buyers are devastated and so are we because that’s our inheritance and we (my siblings) have plans. My sister was going to use her portion to build a new house (she always rented) so this is really screwed up! Help!! Two years ago, the bank we have been using for 45 years for all our financial transactions, we asked for a refinance loan. All credit approvals were done and papers drawn up ready to sign. The appraiser noticed there was a shared driveway. Our loan disappeared because we couldn’t get all parties to sign a maintenance agreement. Since then the interest rate has increased by 2% on the second mortgage. Cannot refinance. What can we do? Without such a maintenance agreement, my neighbors could force me to shoulder the entire burden of the maintenance cost. They get to use it, but don’t have to pay. How is that fair? I couldn’t understand as I read the link to see if the law has passed in Washington yet. Has it? Answer: Don’t think so. The politicians don’t seem to understand the importance.